Whispers and myths of a hollow earth have been with us for a very long time, the earliest references come from ancient people's legends about how and where the human race was born, the Inuit people of Greenland and Northern Canada tell stories of a great land far to the north, where it never gets dark, this place has a mild climate and large lakes that never freeze, where strange animals move in herds, and where birds of many colors fly overhead. A Welsh story writer from the 12th century named Walter Mapes wrote about a prehistoric king of Albion (Britain) named Herla. When King Herla became lost from his soldiers in a great forest he was approached by a dwarf king who took Herla through a tunnel which opened in a sandstone cliff, down into the earth where time ran differently to the world above. Of course both of these accounts can easily be written of as fanciful tales but what has been written about the hollow earth subject in more recent times? Athanasius Kircher was a German scientific researcher and expert linguist, he lived from 1601 to 1680 and was adept in twelve european and oriental languages, he tried to decipher ancient Egyptian hieroglyphics before the Rosetta stone was discovered in 1799, but unfortunately failed to translate them. He also deeply studied and wrote about China, the tower of Babel, mathematics, cosmology, magnetism and medicine, but the reason he's making an appearance in this article is for his book titled the subterranean world in which he writes about the Earths tides being influenced by a subterranean ocean and vast underground caverns. Athanasius was so interested in the idea of a hollow earth that he once paid a guide to take him up mount Vesuvius and lower him into the volcano's crater, which was dangerously close to erupting, so that he could study it from inside. Next we have the astronomer and physicist Edmond Halley, who was born on the 8th of november 1656 and is famous for working out the orbit of (his) Halley's comet. 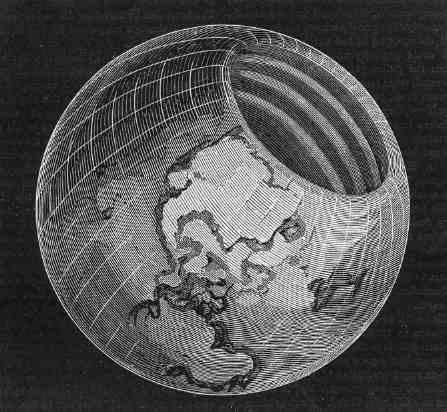 He was also deeply intrigued with the hollow earth legends and first suggested his hollow earth theory in 1692, he theorised that the outer shell was roughly 500 miles thick and that there were two inner shells, each shell including our surface has an ozone layer and the spectacular lights of the aurora borealis were the inner ozone seeping through the north and south poles. For Halley his theory also explained why magnetic compass readings went haywire in certain areas, his thinking being that the inner shells gravity was throwing them off. Now we get to the more interesting and weirder first hand account of admiral Richard E. Byrd. Byrd was a naval officer and his primary duties involved exploring the north and south poles by air. The official accounts of his polar adventures are relatively mundane but from his own personal diary comes an amazing account in which he claims to have flew into a great opening at the north pole where his aeroplane was intercepted by "advanced flying machines" which escorted him to a great city. After being allowed to rest Byrd was interviewed by the senior residents of this city, and during the interview he was told that they were greatly concerned about the work our scientists were carrying out with harnessing the power of the atom, specifically bomb development. Of course admiral Byrd's story has been condemned as false by official sources but of course any government trying to keep such a thing quiet for the psychological benefit of their populace or work force would seek to discredit a witness's testimony such as admiral Richard E. Byrd's who referred to the Arctic as "the land of everlasting mystery".